This month West Hampstead says farewell to Ladudu, the rather good Vietnamese restaurant by the stations. We will be sad to see it go but, as you will find out, when one door closes another one opens (in fact two). Teresa considers herself a West Hampstead local as she lives in the area – it’s her ‘hood’ as she put it. But she got here in a rather roundabout way. Born in Vietnam she fled as child with her family in the war, and they ended up as refugees in Sydney, Australia. After university she worked in IT and decided to take advantage of a one-year visa for a working visit to the UK. That one-year trip has now stretched to twelve as she met and married her husband here. Having lived elsewhere in London, she ended up living in West Hampstead, which she describes as “a great combination of transport links to central London but also all the quaint local shops, a local and cosy feel”. Teresa was always passionate about food and cooking but was not a professional chef. In 2009, she was made redundant and thought it was time to follow her dreams. She started off offering Vietnamese cooking lessons with a view to opening her own restaurant. On her way to work she had walked past Glo on West End Lane. The pan-Asian restaurant closed after about a year, but the prominent site – directly opposite the Iverson Road junction was clearly good. The site became vacant, Teresa had some culinary experience under her belt and she had always wanted to open her own business. Hello Ladudu. About that name. It has featured in some unflattering lists of London restaurant names, so where did it come from? In Vietnamese, la means leaf and dudu means papaya. Put the two together and you get papaya leaf! It is also has a family resonance as Teresa’s grandfather was a herbalist and used to drink papaya leaf tea for its health benefits. Ladudu passed the crucial three-year stage but, like all businesses, had to face some bumps in the road. Last year there were two: Brexit caused a jump in the cost of imported ingredients, but not a jump in the prices she they could charge and a broken water main (in West Hampstead, who’d have thought) damaged the basement kitchen. Although the damage was covered by insurance it still meant the restaurant was out of action over the busy Christmas period. Ladudu’s logo and branding may make it look like a chain, which it isn’t. Teresa had hoped to open another branch, but says that that would have made the business “too commercial”, so instead she took the decision to close the restaurant and focus on other opportunities in order to preserve a lifestyle that still gave her some flexibility. Teresa and her saucy new business. 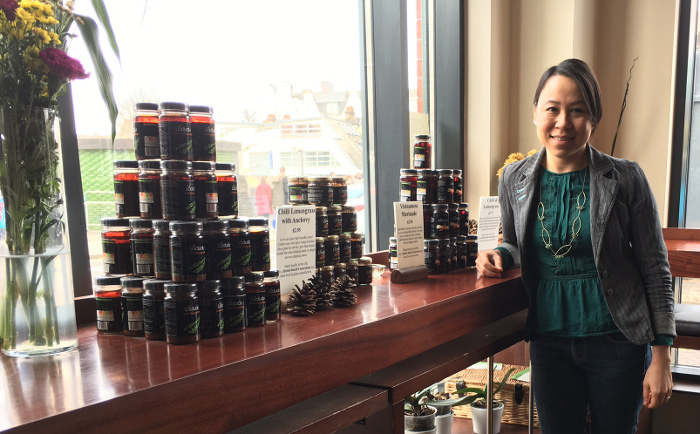 Teresa says she has learned a huge amount in her five years running Ladudu, and saw other opportunities opening up. First, she has started marketing the sauces she was making from scratch for the restaurant and she wants to go back to teaching others how to cook Vietnamese food, but probably this time over the internet. Ladudu sauces will be available at Wing Yip and other Asian grocers around London, plus at the grocers on West End Lane and hopefully Cook too. 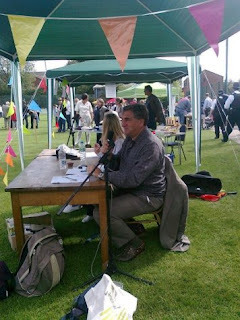 Don’t be surprised if you see a familiar face on Dragon’s Den in the not too distant future. With her background in IT she has also set up systems at the restaurant both for cooking but also for the all important stock and cost control. So she and her husband have set up a company, Insolution software, to sell that too! Plus she is writing a cook book. However, there is one last surprise for West Hampstead. Ladudu closes at the end of the month, but on the last day, Monday 27th, for lunch and dinner (and in between) it will be pay-what-you-want. Head along, enjoy the food one last time – top tip: it’s the best ice cream in West Hampstead – and buy a jar of sauce (or two) so you can take some Ladudu home with you. What of the restaurant? Teresa had interest in the site from Pret and bakery chain Paul. A burger chain was also interested. However, in the end Teresa preferred Rosa’s Thai Café. If you’re not familiar with this small chain, then expect Thai food with a modern twist. It started in Spitalfields and has opened several branches since, the latest one in Brixton. West Hampstead will be the first branch outside Zone 1. 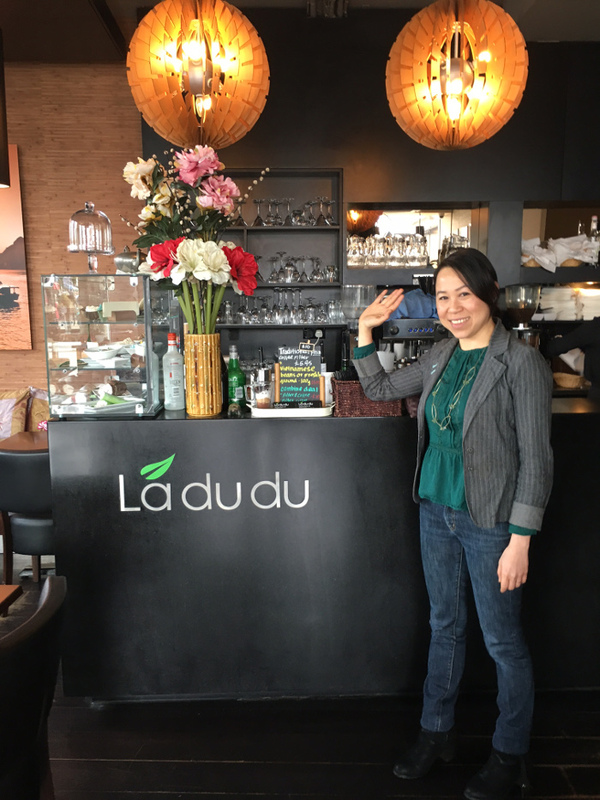 Adieu to Ladudu, all the best to Teresa and thank you for introducing us to some Vietnamese favourites. Who’s going to make WHL’s banh-mi now?